What you should know before you invest in vintage signs - Tin Litho, Paper, Enamel, Porcelain Enamel, Neon or Lighted signs. There are just two categories: 1) genuine American icons for gas and oil, soda signs, ice cream, industrial products, food products and many more; 2) and then there are all the fakes that are and will never be collectable or of any value. We Never Offer Fake Signs with one exception, and we tell you up front and offer it only if it's unusual or well made. We usually acquire these fakes when we purchase large collections, and some may have been misrepresented prior to our physical inspection upon arrival to our facility. These are, for the most part, sold to non-collectors to use as a decorations. Any fake or reproduction signs are clearly marked as such on our website. It is our professional position that collecting signs that are restored or doctored are rendered to almost no value as an investment quality collectable. Our position is that American signage is a big part of American history and represents our cultural identity for a time when America was at its best. We feel these cultural icons should, at all costs, be preserved in their natural state and be observed as historically correct. We only offer genuine investment quality signs to new and experienced collectors - we guarantee it. If for some reason a fake has slipped past our rigorous inspection we will always correct our error to your satisfaction. We do not sell items through this auction, nor do we have any direct affiliation with Barrett-Jackson auctions. We do feel it represents a wide cross section of professional collecting signs around the globe, and is the foremost auction company anywhere in the world. Since this auction sets the trend and keeps meticulous records of its sales over many years time, we feel the study of these sales will allow any collector a true unbiased value on these items at sale, as well as how the market trends are moving. We also feel our consistent standards of restoration are in many cases superior to many of these similar items sold on this auction platform. 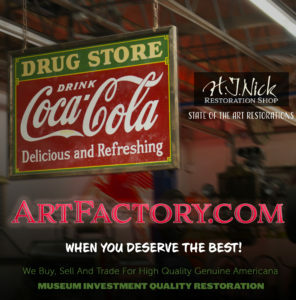 At ArtFactory.com we buy entire collections of high quality antiques or "junk", old gas pumps, coke machines, automobilia, petroliana, man cave toys, and vintage signs. Any condition, we pay top dollar cash and we pick up or ship worldwide, contact us via email or call 1-800-292-0008. Most of our historically correct restored items are utilized for very good causes and many go to not-for-profit museums around the world. When we have the privilege to purchase your vintage American cultural icons you can be reassured they will be treated with the utmost respect. Antiques restored to museum quality, signs preserved in their natural state, historically researched, and presented in a way that preserves each item's historical dignity. Not only that, you are helping American families enjoy gainful employment while being educated on this important American history.